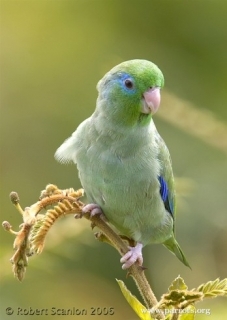 The Spectacled Parrotlet probably benefits from land clearance and logging, unlike most parrot species. F.c. conspicillatus: Male-grey wash on breast; area around eye blue; purple/blue lower back, rump, bend of wing, carpal edge; purple/blue primary and secondary coverts, secondary feathers, underwing coverts and axillary feathers; green primary feathers, washed with purple/blue on innermost primary feathers. Bill horn coloured tinged with pink/brown. Eye dark brown/grey. Female-green replacing all blue markings; bright emerald green surrounding eye. F.c. metae: Male-blue marking behind eye. Female-as in conspicillatus. F.c. caucae: Male-paler blue on lower back, rump and upper and underwing coverts. Heavier, larger bill. Female-as in conspicillatus, but with heavier bill. F.c. conspicillatus: As in adult female, but young males have green mixed in with purple/blue on rump, lower back and wing coverts. Calls made in flight are buzzing and twittering notes. Common in some European countries, rare elsewhere. Indoor or outdoor cage or aviary, minimum length 1.2m (4 ft). Seeds mix such as: canary, millet, and smaller amounts of oats, buckwheat, safflower and a little hemp; limited sunflower seed; spray millet; green leaves such as: Swiss chard, lettuce, sowthistle, dandelion, chickweed; seeding grasses; rearing food made from hard-boiled egg, wholegrain bread and carrot, all ground to crumbly consistency; complete kibble. Provide swings, ropes, ladders, bird-safe wooden chew toys, vegetable tanned leather toys, foraging/puzzle toys, unsprayed fir, pine, willow and elder branches and heat sterilized pine cones. Vertical box 6" x 6" x 6" (15.2cm x 15.2cm x 15.2cm). May have been effected by the wild bird trade in Venezuela. F.c. conspicillatus: E Panama, west to upper Rio Bayano, and N Colombia from upper Rio Sinu valley and lower Rio Cauca valley east to western slopes of Cordillera Oriental in Boyaca and Cundinamarca. F.c. metae: Eastern slopes of Cordillera Oriental in Boyaca, Cundinamarca, and Meta, C Colombia, and east through Vichada and Casanare to W Venezuela, along Rio Meta in western Apure. F.c. caucae: W Colombia, in upper Rio Cauca valley in Antioquia and Caldas, Rio Dagua valley and western slopes of Cordillera Occidental in Valle, Rio Patia valley in Cauca and Narino, and coastal SW Narino. Found up to 1600m (5248 ft) in lightly wooded habitats such as lowland evergreen forest edge, thorn scrub, llanos, gallery woodland and cultivated areas with scattered trees, venturing into denser forest where there are clearings with scattered trees. Feeds on grass and weed seeds, fruit, berries, blossoms and buds. Social outside of breeding season. Forms communal roosts for the night. Feeds on the ground and in vegetation. 4-6 spherical to elliptical eggs, 18.0 x 16.0mm (0.7 x 0.6 in).